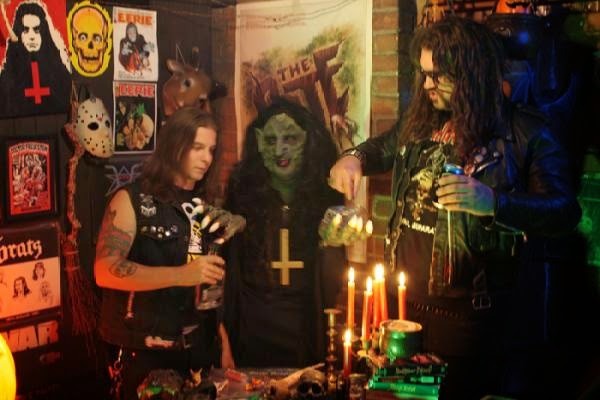 Acid Witch and Nunslaughter are the two most recognizable names engraved upon the unholy upside-down cross that bears the Hell's Headbangers Records roster. 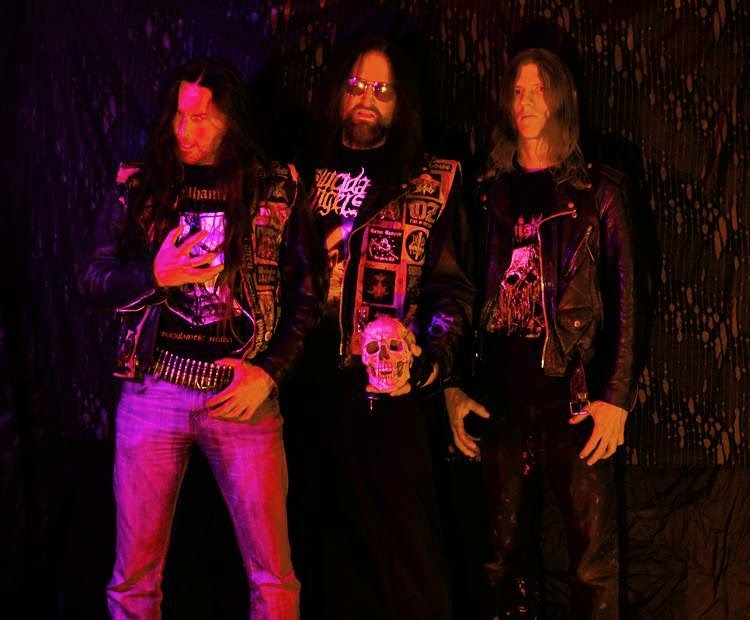 While the macabre sounds of Acid Witch have been laying dormant since the release of their second full-length album, Stoned, in 2010, Nunslaughter have released an uncountable number of EPs, live albums and splits since their last full-length album, Hex, in 2007. Either way, even if these two entities had just released new material it's about damn time that they come together to release a split. 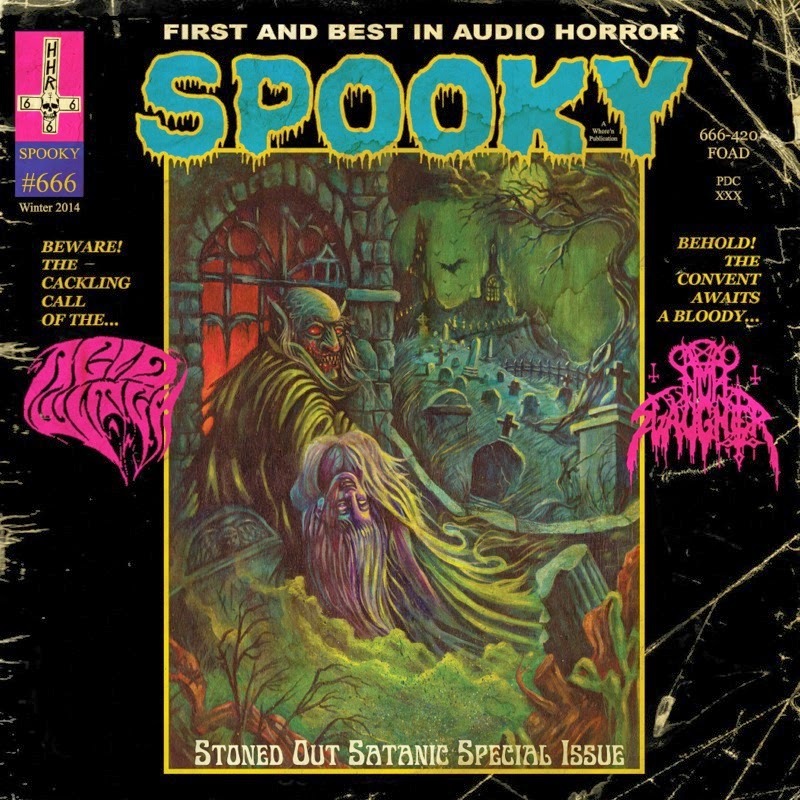 Does Spooky fulfill the immense wishes and desires of the Hell's Headbangers Records cultists? A moment must be taken to admire the artwork at hand here. Done in the style of old records from the 1970's and 1980's lo-fi era, as well as hints of old E.C. comics, the classically styled artwork stands out in a beautifully creepy way. The poisonous looking fog among broken, slimy trees and branches adds anticipation to the expected backwoods Louisiana swamp feel that Acid Witch give off as their witchy mascot carries a ghostly woman off into what would appear to be the gateway to hell. The scratches and bends, obviously added in for effect, just give the cover art that much more old school charm to appreciate. The track listing is different than a normal split, which is typically divided up per album side; band one would appear on side A while band two would appear on side B. In the case of Spooky, Nunslaughter and Acid Witch share the stage on both sides of the split and rather the tracks are split up by genre. The listener will find that side A, which contains "Evil" by Acid Witch and "Spooky Tails" by Nunslaughter is aptly entitled "doom" where as side B contains "A Sordid Past" by Nunslaughter and "Fiends of Old" by Acid Witch and is labeled "death". Nunslaughter's "Spooky Tails" is a track that showcases the chugging doom side of old school death metal ala Asphyx and Grave. The composition finds itself heavy with palm muted riffs and catchy one string bridges with brief hi-hat hits to accent the background. A little more than halfway through the song changes its structure and adds in soft wind elements for a haunting atmospheric effect while a low string bridge finds itself in the front of the mix, being backed by eerie tribal drumming. The lyrics are just as noteworthy and memorable as they tell a tale of creepy crawly critters in such a manner that is reminiscent of something that would've been found in old issues of Weird Tales. On the completely opposite end of the spectrum is "A Sordid Past", which is a faster paced death metal endeavor that uses galloping palm muted guitar riffs and both galloping and blast beat drums. Of the four tracks, this song is the least captivating and most generic of the lot; however that doesn't mean that it's bad, it just doesn't stand out as well. For those of you who've been anxiously anticipating any small morsel of Acid Witch riffage wait no longer. 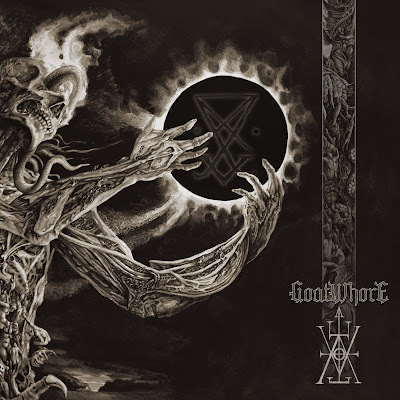 The great news for this split is that Acid Witch have kept all of their best elements from both Witchtanic Hellucinations and Stoned and have combined them to create the two tracks found on this album, as well they have shown increased skill and an entirely new side to their song composures. "Evil" proves itself to be a track that could be mistaken for a lost track from their debut album. It's full of the unforgettable keyboards that've lined their material from the start, along with the gruff, unique heavy guitar tone that appeared in their second full-length. This track embellishes a fantastic solo, a first for Acid Witch to the extent that it carries and it adds a slight melodic flavor to the content where as in previous material the keyboards were left to do most of the solo work. Lyrically this track is a purely satanic bible bashing hymn that pushes the boundaries of what the duo have sung about previously. "Fiends of Old" is where the minds of long standing Acid Witch fans will be blown. 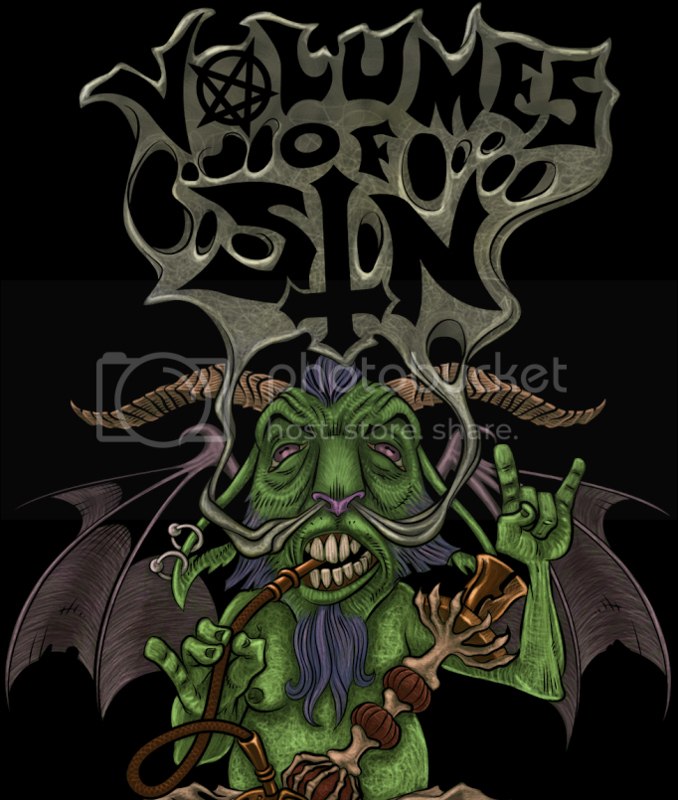 While this track starts out like many others from the band, with a talking audio snippet, the composition erupts into a fiery haze of thrash metal delight. Keeping with the heavy tuning and distortion, blast beats line the background while the guitar strums at a lightning pace. Occasionally the composure allows for groovy breaks of keyboards and hypnotic guitar rhythms before ascending to the uptempo pace once more. There's another solo present in this track, although five times as fast as what is heard in their initial song. Both Acid Witch and Nunslaughter have outdone themselves in Spooky to create a memorable split experience from two of the greatest bands on Hell's Headbangers Records. Acid Witch took a chance and put something completely different out there with their thrashy neo-death metal bashing movement in "Fiends of Old" while still recalling their roots with "Evil". Nunslaughter also give an outstanding performance, although "A Sordid Past" is not much more than what one would typically hear from them, it's the dark, doomish "Spooky Tails" where they truly stand out. Although Acid Witch tend to stand out more on this release due to the fact that they haven't released any new material in four years and they've incorporated longer guitar solos into their content, both groups did one track in their comfort zone and one track to showcase a different side of their sound. A must hear for fans of either band and also potential new fans. Four outstanding songs by two great artists, all for the low price of $7.77 in two different colors on Hell's Headbangers Records website.